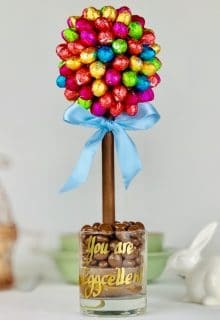 A decadent Gin and Tonic Truffle Tree, made from smooth truffles and pink edible roses, a truly luxurious & scrumptious present for someone special. May contain Cereals containing Gluten, contains Milk, may contain Nuts, Peanuts,contains Soya, Cocoa Mass, Sugar, Cocoa Butter, Whole Milk, Emulsifier, Soy Lecithin-E322, Flavouring, Natural Vanilla. Powder Cocoa.